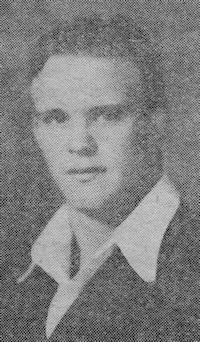 Obituary – Cain, James H. “Jimmie” « Perry High School Alumni Association, Inc.
– son of Fannie Cain of Lucien, was born in Barnsdall, Okla. on Oct. 17, 1917 and attended the elementary grades in Barnsdall. He attended high school in Marshall and Perry. During this high school career he was a member of the football squad and wrestling team. Following graduation he expects to attend college. Jimmie Cain, 75, longtime resident of the Perry community, died at 10 p.m. Tuesday, Aug. 3, 1993, at Presbyterian hospital in Oklahoma City. Funeral will be at 2 p.m. Saturday at the First United Methodist church with Rev. Cortez Cranfill, pastor, officiating. Burial will be at Grace Hill cemetery under direction of Brown Funeral home. Memorials may be made to the First United Methodist Youth program. Cain was the son of Joseph and Fannie Cain and was born at Marshall on Oct. 17, 1917. He was a graduate of Perry high school and attended Central State university at Edmond. He began working at Donaldson & Yahn while a high school student and was employed there until he retired in 1960. He and Alene Ballew were married on Sept. 13, 1941. She preceded her husband in death. Cain married Lucille Craft on July 18, 1985. She also preceded him in death. Cain moved to Cape Girardeau, Mo. in 1960, to Louisburg, Kan. in 1969, to Beloit, Kan. in 1979 and back to Perry in 1982. He was a member of First United Methodist church, was president of the Perry Lions club in 1960, had served on the Perry board of education and had been a member of the Perry city council. 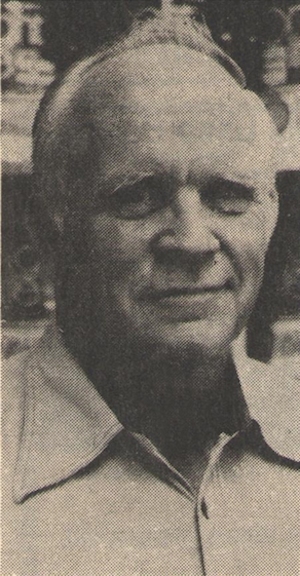 Cain had been an announcer for Perry Maroon football games and had written sports articles. In addition to his wives, Cain was preceded in death by five brothers and two sisters. Among survivors are a daughter, Linda Blanding, Beloit, Kan.; a son, James “Sonny” Cain Jr., Boston, Mass. ; one sister, Edith Benedict, Tulsa; five grandchildren, one great grand¬child and many other devoted relatives and friends.